Rest all love. Give people you expensive journey of their dreams, and they will fondly remember this gift for years to come. Even the most The highly experienced person will find something new and not experienced for themselves in the range of options we offer tours, excursions and trips. Gift Certificate — this is the most desired gift: suddenly, original and tasteful! The certificate holder chooses a suitable tour: Tour date, route, type of recreation, service, hotel — hotel — it all depends on the customer’s wishes. We offer a huge range of tours and excursions on Kamchatka holidays to suit all tastes! Certificate has no fixed value, it can vary from 1 000 to 500 000 rubles. You choose its denomination. Price of the tour selected above? Then just additional payments. Surcharge to its real value. And you can gather a few donated certificates and exchange them for one exciting journey! Would you like to give a particular tour or journey, knowing the wishes of a loved one. Just place a gift certificate for a tour that you are interested in. Gift certificate valid for one year from date of purchase of the certificate. Presenter Gift Certificate will be entitled to purchase Tours (services) in the amount specified in the contract. Treaty necessarily attached to a gift certificate. The certificate is not valid without a contract. If the amount of Tours (services) exceeds the amount of the gift certificate, the bearer of the certificate is subject to charge. The balance from the certificate shall not be issued. Gift certificate no return, and after the loss of non-refundable. 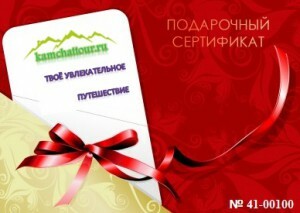 A gift certificate is the property of the travel agency «Kamchatkiy Tour» and on the use of non-refundable. It’s nice when you can buy a great gift without effort. Gift Certificate can be paid by any convenient method: cash, credit card, by bank transfer. You can discuss all questions and suggestions to managers by phone: 8 (914) 024-34-05. Gift Certificate you can buy in our office (contact). Gift Certificate travel company «Kamchatkiy Tour» — this is probably one of the best answers to the age-old question, «What is present on the occasion of …?». Hurry up to take advantage of our offer!